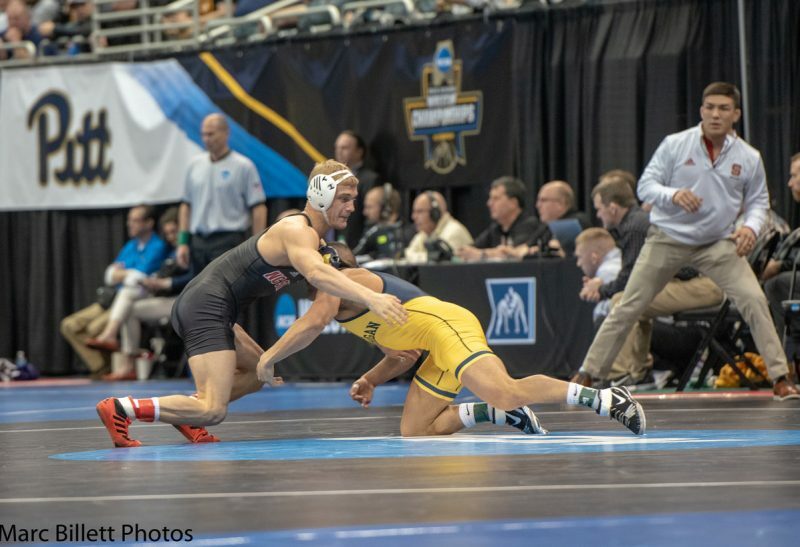 North Carolina State sophomore Hayden Hidlay began his second NCAA Division I appearance with a much different place in the 157-pound bracket. Hidlay, a Mifflin County graduate, was the No. 1 seed in last year’s NCAA debut. He advanced to the title match before dropping a 6-2 decision to Penn State’s Jason Nolf, a Kittanning graduate who claimed his second title. The 2019 tournament began Thursday, at Pittsburgh’s PPG Paints Arena, and Hidlay was the No. 5 seed, while Nolf is seeded No. 1. Hidlay opened the tournament with a 16-1 technical fall against Oregon State’s Hunter Willits. Hidlay was just as dominant in the second round, and actually recorded the same score of 16-1, in his technical fall of Oklahoma’s Justin Thomas. In the quarterfinal Hidlay scored a take down in sudden victory over fourth seed Alec Pantaleo of Michigan 5-3 in overtime. Hidlay is happy the tournament is in Pittsburgh. His family is also pleased with the site. Hidlay will have an NCAA Finals rematch with Nolf in the semifinals on Friday night.